Did you know there are still several states in the US where employers can fire me for being gay? Legislation and protections have improved in the past several years, but there are still large gaps throughout the United States for queer and trans people. In addition, I hear horror stories of toxic workplaces that my LGBTQ+ friends have endured and/or have pushed them out of a job due to not feeling safe. I have been incredibly lucky to have a career full of supportive companies where I have felt safe and accepted. But I also have another big thing that has helped me for over 13 years: WordPress. Back when I was in high school in the mid nineties, I was fortunate enough to have access to a computer that connected to this new “internet” thing. This was in 1996 when we had to call the internet. I remember vividly spending nights browsing all these “homepages” of people—even people that were my age—from all over the world. One night I thought, “One day I want to make one of these…” I literally stopped mid thought and decided that I was just going to start right that instant. I signed up for a free Angelfire account using my mom’s email address, and was off and running. Angelfire gave you an advanced option of a code editor, so I copied and pasted and poked and prodded code all summer. As a result, I taught myself a good chunk of HTML by creating some of the ugliest pages in internet history. But that started me on a path that I would never look back from. I saw such great potential in connecting with others using this whole “World Wide Web” thing I had just discovered. Fast forward some years into college and the dawn of the 2000’s when this crazy idea of sharing a journal on the internet started. Web logs—later termed “blogs”—started popping up left and right. I hopped on board with a blogger.com blog almost exactly 17 years ago (10/19/00), then moved to this blogging platform known as b2 just about a year later. Some may recognize this, because b2 by cafelog was the codebase forked to create the first WordPress. So technically, I’ve been using WordPress since before it was WordPress. Back when blogging first became a thing, commenting systems weren’t developed yet, so it was more like just shouting into space wondering if anyone was listening. But people were. Some of us added message boards to our sites. Conversations happened, connections were made and communities started to form. Some of these connections are still some of my close friends today. We share a special bond because we all kind of learned the internet together. These created communities also helped me feel less like an outcast and gave me hope that I wasn’t the only one that felt out of place like I did. People’s blogs were vulnerable glimpses into their lives and hardships, really helping me see I was not alone and even helping me face some of my own struggles. Back then I didn’t realize I was gay, but I did feel strangely out of place in so many parts of my life. In my late 20’s I finally realized, accepted and came out to myself that I was a lesbian. For many years following I stumbled around a lot to find my true expression and identity. Not to mention shed—and recover from—the many external pressures that were forcing me into a completely fabricated heteronormative “box” that I did not fit. It took well into my 30’s to find my comfort zone as an androgynous/masculine of center expressing, gay woman. With that, my outward expression and style creates a daily “coming out” to everyone I meet… or at the very least, draws attention to me when in midwestern heteronormative spaces. Thus, putting me a bit more at risk of being targeted for being queer. Back to the subject at hand, how does all this relate to WordPress? Throughout this whole journey of self discovery, I was continually using and learning WordPress as well. By the time I had come out, I had learned enough about working with WordPress templates to create custom websites. This gave me the tools to create my own job if I ever lost my full time employment, or would find myself in a toxic, unhealthy—or even dangerous—working environment. WordPress became my ticket to being self sufficient and confident in my career. 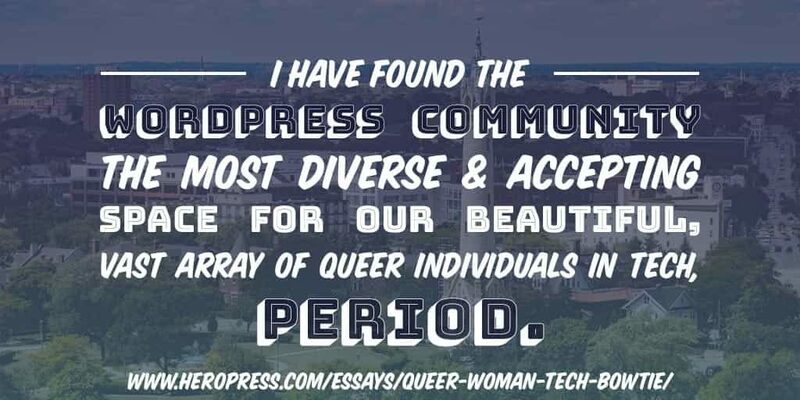 On top of it all, I have found the WordPress community the most diverse and accepting space for our beautiful, vast array of queer individuals in tech, period. This made the decision to join in the WordPress community an easy and safe choice. I had not seen many people like me at tech-related events before, let alone speaking at one. But WordCamps have given me the ability to be that gay woman in a bowtie speaking at the front of the room that I had not seen represented before. And that I can do that without fear is priceless! WordPress and this wonderful community has helped me feel more confident in who I am as a web creator, but more importantly, a person. The post Queer Woman In Tech … In A Bowtie appeared first on HeroPress.